I’ve written about this before, but one of my favorite research tips for fiction is to shop the catalogue. The way Tom Franklin describes it, if he ever got stuck while writing Hell at the Breech, he would take up his Sears & Roebuck catalogue from 1898 and find an item that caught his attention, and then — using the very detailed descriptions and illustrations in the catalogue — he would write about that item, give it to a character in the novel, and let the story unfold from there. And a lot of that made it into his novel. The characters in my new novel are ex-soldiers who served in the Civil War, and even though the book is set years after the war, they still hang onto a lot of their old firearms and camp gear. So I’ve been wasting a lot of time this week doing internet research on period-accurate arms and gear, and I figured it was time to get a kind of “catalogue” of my own. That’s what these two books on the left are for: from now on, instead of writing until I need a detail, I’m going to start with the detail by flipping to something cool in one of these books, giving it to one of my characters, and writing from that. 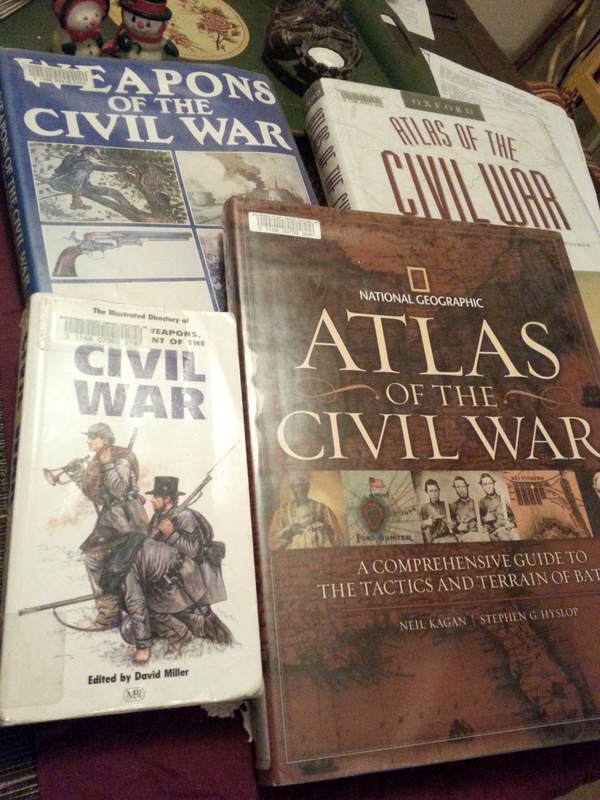 The two books on the right are Civil War atlases, which I need less because I’m not really writing about the war, but these characters are coming together from a variety of backgrounds and regions, so these period maps will help me keep my bearings. Or, they will after the holidays, because I’m taking Christmas Eve and Christmas Day off. So, until this weekend: Happy Hanukkah, Merry Christmas, and Happy Kwanza, friends! I envy my agent, because as a mature student, he has access to an endless list of endless journals on line (all he has to do is find an article on Google Scholar and he’s laughing! ), plus he has access to the actual stacks in at least one Russell Group university. If it’s researchable, he will research it!